From California Highways and Public Works, July-August 1962. The original highway designation was Interstate 5W. Note The Saw Mill building, still with its tower. The MacArthur Freeway (Interstate 580, I-580 or simply 580) runs 12.4 miles in Oakland, roughly tracing the base of the Oakland hills from the San Leandro City limits to the San Francisco-Oakland Bay Bridge approach. Nearly 1.5 million dollars was spent landscaping the freeway, which was completed in 1966, and it was awarded first prize in the United States Department of Transportation's Second Annual Highway Beauty Awards Competition in 1969. In 1970, the MacArthur Freeway was included in the State Scenic Highways System by an act of the State legislature. At the time of construction, citizens rallied to the cause of banning trucks on the 8.7-mile long segment of I-580 between Grand Avenue and Foothill Boulevard in San Leandro — and the federal and state governments agreed to the restriction, in part because there was an existing truck ban on the existing highway in the corridor, MacArthur Boulevard.1 This truck ban, which remains in place today despite occasional attempts to have the restriction lifted, is one of the reasons the parallel section of Nimitz Freeway is considered to be unsafe. 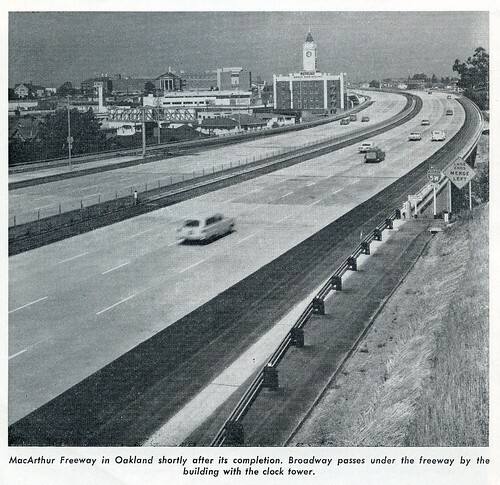 ...interested in learning more about impressive views of highways in Oakland?